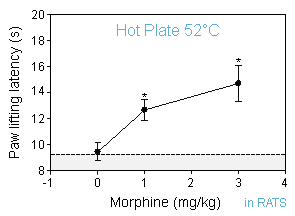 The hot-plate test consists in a thermal pain measurement. 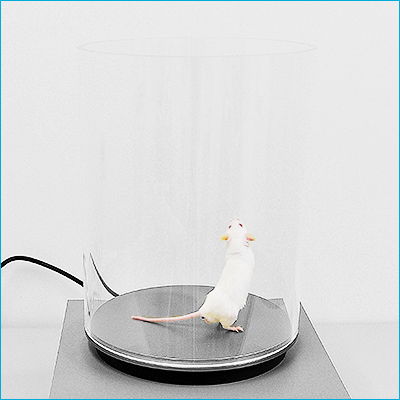 In this test, the animal is placed on a heated-plate to measure his thermal pain reflexes which are characterized either by withdrawal of the paw or by licking. This model has been implemented at Neurofit to evaluate the efficacy of your anti-inflammatory compounds or pain killers. Pain killers or anti-inflammatory drugs are usually tested in this model but other treatments could also be considered. Please feel free to contact us to discuss the feasibility of your study. 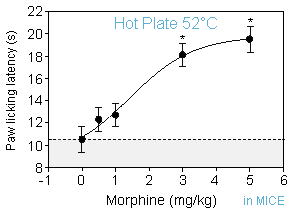 Withdrawal or licking latency (s) in the hot-plate test. Better mirror clinical conditions of pain than tests that use a brief and high intensity mechanical or thermal stimulation and measure spinal-mediated reflex responses. Measure of the normal nociceptive thresholds upon application of painful stimuli remains the most used assay for the screening of analgesic potential of new drugs.